Oro Dulce is an immersion into an agrarian artisanal production process, aiming to generate a discussion about new forms of urban-rural habitability in a territory of growing interconnectivity and hybridization; in a land that shakes constantly; with an increasingly globalized culture. The project originated in rural Pichingal located in the Maule Region in Chile where artist Francisca Benitez joined the annual quince making activities of her family. The actions were documented in this 90-minute video. It is a performance scripted and directed by the artist’s mother, occurring every fall and involving a fluctuating number of participants. The work is about knowledge transmission, immaterial patrimony, and anonymous creative practices that exist despite the “mall culture” that grows so rapidly and devastatingly in the area. It is about an alternative economy based on another type of gold standard; an edible capital. It is about life; about love; a golden substance that covers every horizontal surface inside individuals’ homes in April, allowing the family to come together and grow. 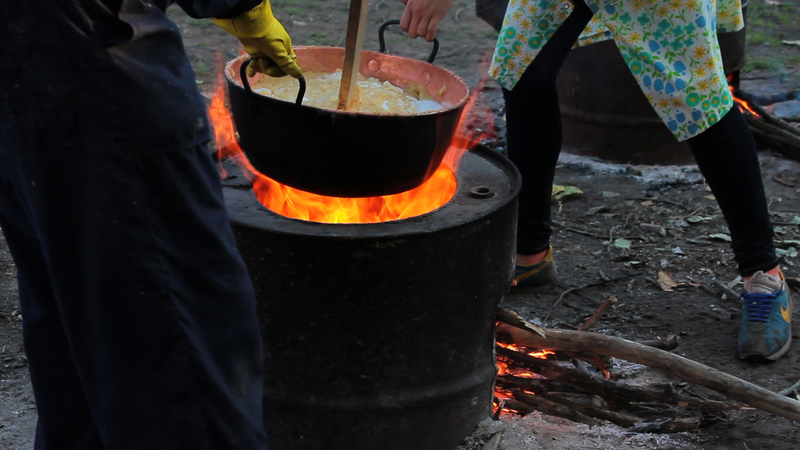 On view for the first time in New York, Oro Dulce was originally exhibited at Die Ecke Gallery in Santiago, Chile in Spring 2011, along with the 1,170 lbs of quince jam produced during the filming. For the duration of the exhibit, the art gallery became the distribution outlet for the product, overlapping the present and past roles of the corner building as an art gallery and corner store. Reedited for this exhibition, the video brings awareness to the process of making behind the food we eat, which is so often anonymous. Cuchifritos Gallery’s location within the Essex Street Market serves as an ideal venue for an intimate glimpse into a process rooted in tradition, bringing together an entire community. Camila Marambio is an independent curator, private investigator and amateur dancer with an MA in Modern Art: Critical and Curatorial Studies from Columbia University. She also attended de Appel’s curatorial programme in 2006/2007 after which she directed the Visual Arts Department of the cultural centre Matucana 100 in Santiago, Chile. Currently, she directs the research residency program Ensayos–based in Tierra del Fuego–through which artists, scientists, and local inhabitants contemplate and engage in Ecological activity. In 2014 she will again take up residency at Kadist Art Foundation in Paris.